What do Jeremy Corbyn's ideas on foreign policy mean for the UK's international relations? The Russian ambassador to the UK hailed his Labour leadership victory as the most "radical breakthrough in British politics" in 30 years. Top officials in the US administration were reportedly aghast when they looked closely at some of his past positions. And UK Prime Minister David Cameron told the Conservative Party conference: "We cannot let that man inflict his security-threatening, terrorist-sympathising, Britain-hating ideology on the country we love." But how radical a shift for the Labour Party does Mr Corbyn represent when it comes to key foreign policy issues? Initially his position on whether to stay in the EU or leave was ambiguous. Mr Corbyn said he wanted a Europe that did more for social and environmental protections and not just the free market. He lambasted the EU's talks with the US over a new Transatlantic Trade and Investment Partnership (TTIP) as "secret negotiations" that would "sign away" many public services. He said he had mixed feelings about the upcoming EU referendum and hinted he might not campaign to stay in. But later he clarified that he could not foresee Labour under his leadership campaigning to leave the EU, and he used his conference speech to call for a "vision of social Europe" to protect workers' rights and offer more help to refugees. His shadow foreign secretary, Hilary Benn, went further, declaring unequivocally that "Britain's future lies in Europe", the coming EU referendum was the most important decision for 40 years for Britain's place in the world, and there would be a Labour campaign to stay in. In the past, Mr Corbyn has called for Britain to pull out of the Nato alliance and scrap its Trident nuclear deterrent, dismissing both as outdated relics from the Cold War. Since becoming party leader he has backtracked on leaving Nato, but his personal opposition to Trident remains strong. However, not everyone, including his own deputy leader, agrees with him. In a blow to his leadership, trade union leaders (concerned about defence jobs) blocked a vote at Labour's conference on whether to scrap Trident. Instead, the conference voted to keep Labour's official position in support of a "continuous at-sea deterrent" - in other words, maintaining Trident. Mr Corbyn has said he will continue to try to persuade colleagues to change their minds. Criticism of Nato has also coloured the Labour leader's attitude towards Russia's role over the past two years in Ukraine. He has argued the "hypocrisy of the West" and the eastward expansion of Nato was partly to blame for provoking the conflict in Ukraine, though he admits that Russia violated Ukraine's sovereignty by taking over Crimea. 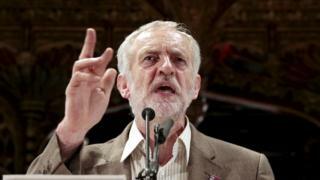 More recently as Labour Party leader, he has said he is "not an admirer of Putin's foreign policy". But his bottom-line position is that it is better to reach out through diplomacy to "talk to everyone" (even groups like Hamas and Hezbollah) rather than promote further confrontation and bloodshed through military options. Mr Corbyn has consistently been opposed to "military interventions" on principle, including what he has called the "disaster" of the 2003 Iraq invasion. He has even suggested the former British Prime Minister Tony Blair could end up facing a war crimes tribunal for his part in leading the country into what Mr Corbyn says was an illegal war. He has said he will oppose any new vote in Parliament for air strikes against the so-called Islamic State (IS) in Syria as well as Iraq, because bombing would only make IS militants stronger. Instead, he has argued for isolating the jihadists through collective diplomacy involving all Syria's neighbours and Russia. But this is another issue that divides Labour MPs, some of whom have indicated they might defy him to side with the government if it pushed for a vote to approve UK air strikes in Syria as well as Iraq. And since Russia has begun its own bombing campaign in Syria, Mr Corbyn has not made clear whether he is prepared to condemn "military intervention" in the Syria conflict by Russia as well. Overall, Mr Corbyn says the country needs a "radically different foreign policy", including standing up for human rights instead of selling weapons to repressive regimes, more international collaboration, and "clever, patient, difficult" diplomacy rather than military interventions. But at the same time, in his conference speech he called for "strong modern military and security forces" to keep Britain safe, and for jobs in the defence industry to be protected. And not everyone on Labour's shadow front bench shares their new leader's positions. Mr Corbyn embraces that difference of opinion as a strength, saying that airing diverse views within the party and not always agreeing on everything is part of his "new politics". But it means that how far his past personal radicalism will translate into party positions remains unclear. Labour conference: An activist's speech from leader Corbyn?